To participate in the forays, an individual's dues must be paid. Dues cover the calendar year January 1 thru December 31st and are not pro-rated. Rates are the same whether you pay in January or July. Yearly dues remain $10 per individual, $15 per family which covers the four annual forays. You can print a membership application from the club's website and mail this application, along with your check to our treasurer Tom Sweeney. All SVMS forays: Sign In At 9:30am. Walks Will Start Promptly At 10:00am. No dogs are allowed at Any Forays. NOTE: Bring to each foray your own chair and drink! You will probably eat more than the cost of membership in foods provided at the forays. Most of our activities are in Broome and Tioga counties in New York, and Susquehanna county in Pennsylvania. Follow the link to see photos from previous forays. This foray will be hosted by Richard Progovitz, but located at Gil's cottage. Meet at the Littlefeild farm Cottage at 9:30 am. Look for signs. The Cottage is White and on the North side of the road. 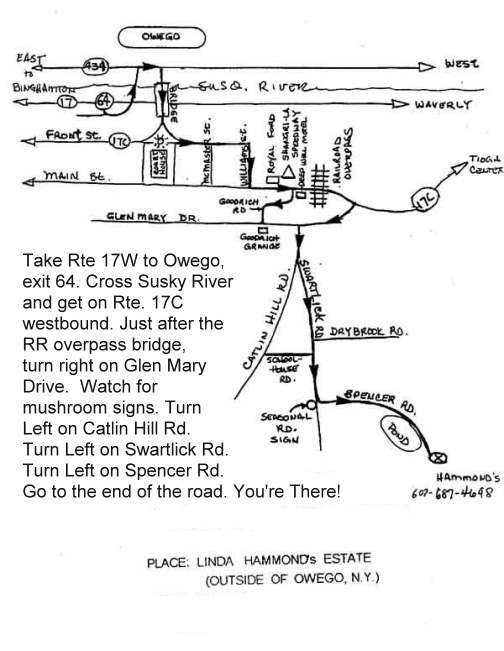 Traveling west to east, additional parking is at Gil's located beyond the cottage, on the same side of the road. His place has tan siding and red brick. Trucks can park in front of the pond if the ground is dry enough. Two forays will be offered. A more easygoing and shorter in distance foray, and the usual high paced dash to hit the known morel patches. 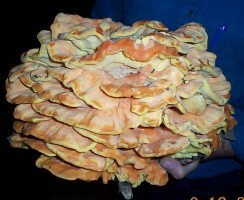 Also: "Mushroom Cultivation" --a talk and demo with spawn to take home. The SVMS second summer foray is held at Littlefield Farm. Please come to commute for the day. All formal activities at the foray will start at 9:30am Saturday morning and last till Saturday after lunch. This is an outdoor event so bring your tent if you wish to camp. As usual, please bring a dish to pass for Saturday's Lunch. There will be multiple foray trails and there is a good track record of this location providing a wealth of mushroom varieties this time of year. 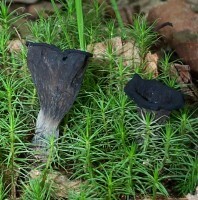 In past year edible mushrooms have been found and cooked on site. 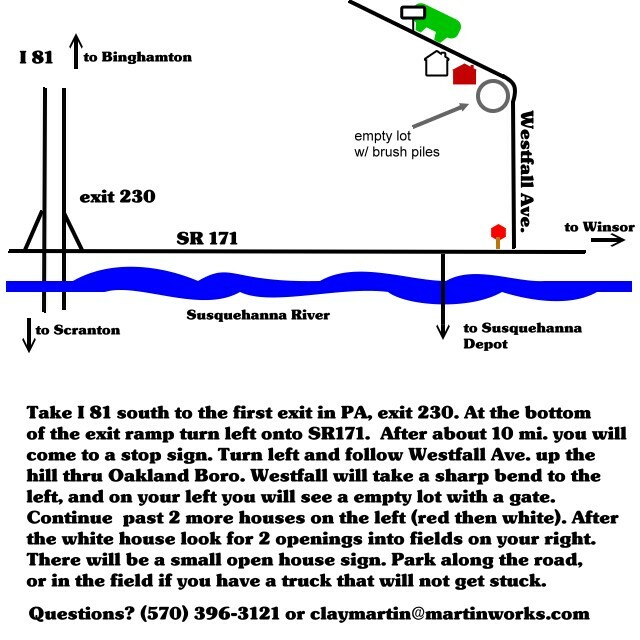 Directions: From Binghamton, go to I88 and get off at Exit 3 in Port Crane. 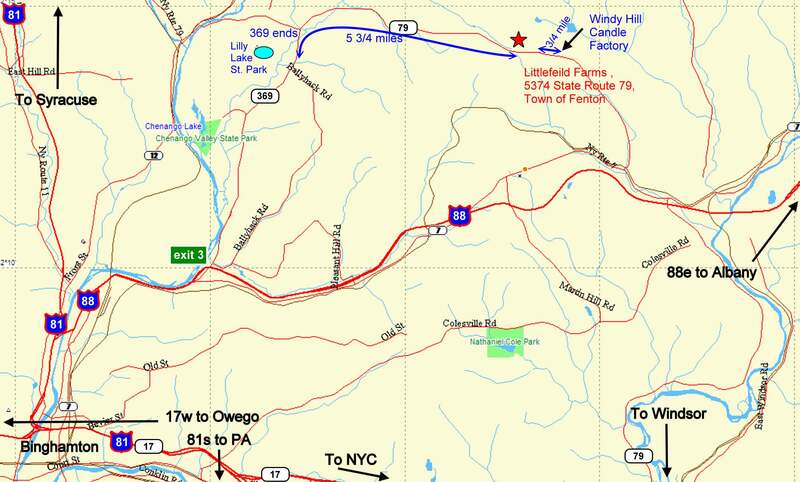 Take a left at the stop sign and stay on 369E, which changes into Route 79. we are approximately 5 3/4 miles past State Park (Lilly Lake) and 3/4 mile before you get to “Windy Hill Candle Factory”, on Route 79. Also: We will have a microscope and things to see . 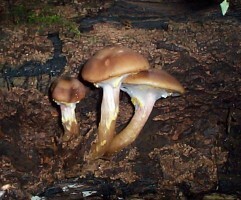 Copyright © 2000-, Susquehanna Valley Mycological Society, Text, graphics, and HTML code are protected by US and International Copyright Laws, and may not be copied, reprinted, published, translated, hosted, or otherwise distributed by any means without explicit permission.